Aluminum door canopies are the perfect choice when you need protection from the elements. Our aluminum canopies are made to last and feature a heavy-duty mill finish aluminum framework. Door canopies are designed to protect your entry from both the rain and the snow. Includes support arms. Support arms require a minimum of 3 inch of mounting space over the door. Includes 5-year warranty against manufacturing defects. Width is 40 inches and projection is 42 inches. Easy to install. Assembly and installation instructions are included. Color: White optional sidewings are available item # 42000. 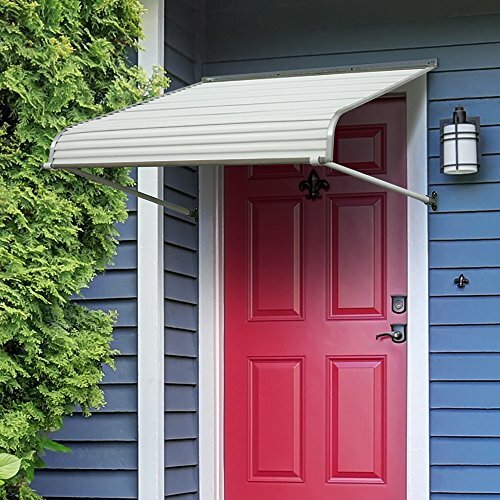 If you have any questions about this product by NuImage Awnings, contact us by completing and submitting the form below. If you are looking for a specif part number, please include it with your message. 3ft. Handrail - Anodized Aluminum with 2 Matte Nickel Wall Brackets and ADA Returns - 1.6" Round - OVERALL LENGTH: 41"